I’ve been getting loads of emails lately asking when the third book in my Mortician’s Daughter series will be out. I’m excited to announce Three Heartbeats Away will be released on June 18th. I recently did an interview for For the Love of Kid Lit with Jennifer Mary G, and I thought you might enjoy it. In Another Life has already received such great reviews on Goodreads. Do you read reviews? Do fans ever give you ideas for new stories? I do read reviews. Most of the time with one eye closed and a promise to myself that I won’t take the bad ones personally. I know most writers prefer not to read them because some are . . . mean spirited. I tell myself that books are like ice cream and not everyone likes the flavor of books I write. I can accept that. Fans do occasionally offer ideas. But I find most ideas need to be organically grown from my own experiences and emotions for me to feel passionate about it. 2. 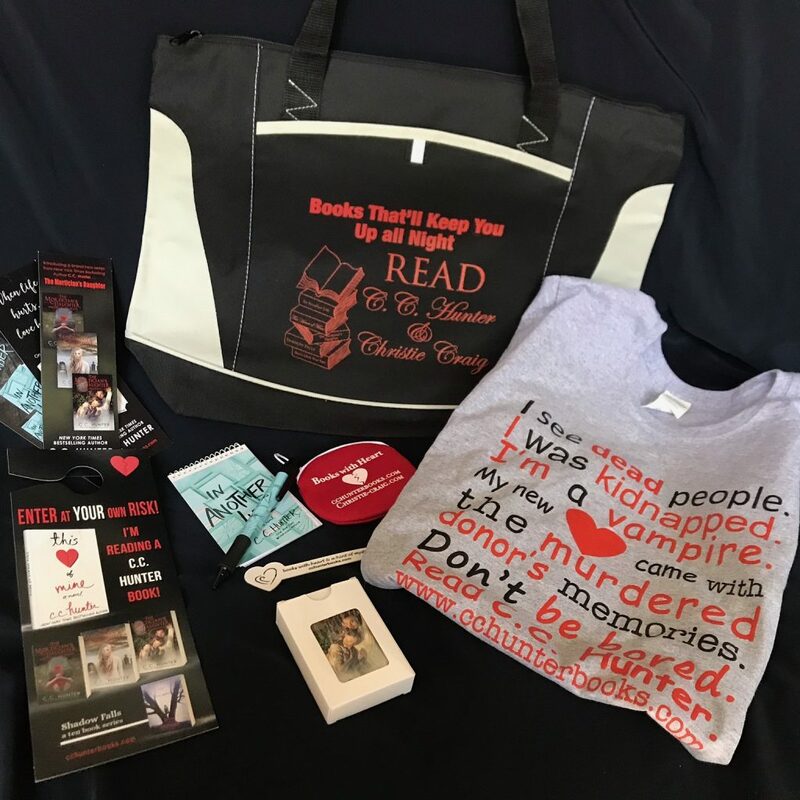 Your recent YA novels meld serious life-circumstances (such as organ donation and adoption) with traditional teen themes of school, family, and romance — and then to make things even more interesting, you infuse mystery and suspense! How do you juggle all of these threads? Do you outline your novels or do you just free-write? I didn’t start out writing YA. In fact, I didn’t plan on it. An editor had read my humorous romantic suspense novels and asked if I would try writing a paranormal YA series. However, because I wasn’t a YA reader at the time, I had to do a crash course. I bought about sixteen books and I read and analyzed them. Then I did a long stroll down memory lane back to my teenage years. I learned the things that concerned me, pained me, and inspired me were the same elements I found in the books: romance, friendships, parents, self-discovery, self-esteem, and the need for independence. I knew I had to have those elements in my stories. Some of my books are paranormal, like the Shadow Falls series and The Mortician’s Daughter series. On top of the life-issues themes, I try to find plots with a wow factor. i.e. Girl gets a heart transplant, but it comes with the donors memories. Girl, adopted at three, learns she may have been kidnapped and not given away. Daughter of a mortician’s can see and speak to the spirits her dad works on and they want her to fix their last problems. As for the suspense and mystery, call me an adrenaline junkie, but I love what a little danger brings to a story. I’m not a plotter. I love discovering the story as I write. Yes, I know my wow factor and I have some of the plot points, but if I knew everything, writing would be boring. I see writing as sort of like weaving. The themes/elements are threads. If woven in one scene is the suspense and parental issues of the story, I know I need to pull in the threads of romance and friendship into an upcoming scene. 3. On your website bio I learned that you sold your first book in 1994, but then didn’t sell another until 2007! I imagine that can be extremely daunting. What gave you the motivation to keep going as a writer? Did you have an agent during those quiet years? What’s even more disheartening is I started writing in 1984. So it took me ten years to sell my first book and thirteen more years to sell my second. That said, I sold four books at once when I sold my second. And In Another Life is my 43rd book if you count my novellas and non-fiction books. So I am not what you would call an overnight success. I have received over 3000 rejections. Was it daunting? Yes, but you have to understand that I’m dyslexic. Nothing came easy for me. And maybe because of this, I was willing to fail and try again. Now, those rejections are not just from novels. When I couldn’t sell my second book in 1994, I started writing for magazines. I wrote travel articles, fillers, essays, profile pieces, and columns. I wrote approximately three pieces a week and if it came back rejected, I’d try to improve it then I’d send it right back out. It took a while before my freelance work took off, but a sale here and there kept me motivated. Eventually, I was selling to the bigger magazines. I put the novel writing on back burner and focused on my freelance career. In 2000, my daughter graduated from college and I told my husband I was going to start writing novels again. It took six years for me to sell, but during that time, I wrote eight completed novels and five proposals. And I sold all but five. Kellsey Walker you won last week’s giveaway! You’ve won a C.C. Hunter t-shirt. Congratulations! 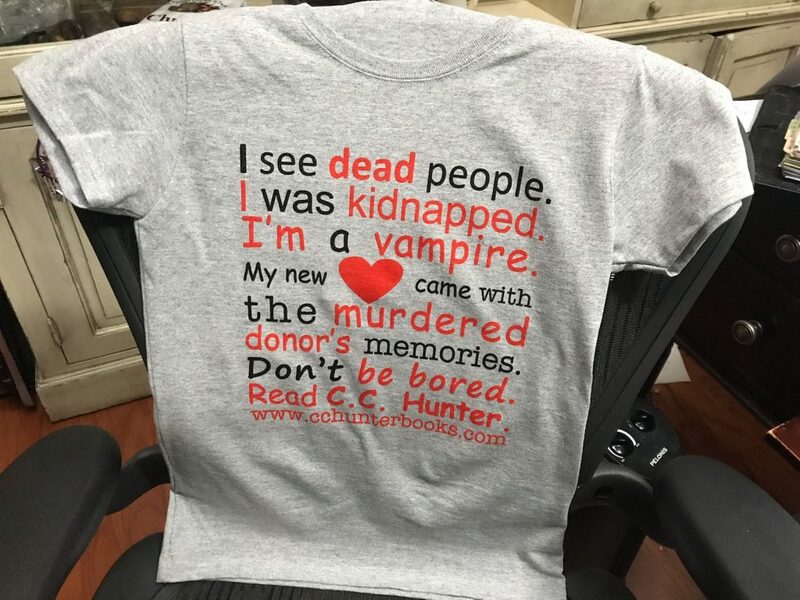 Please email me at cc@cchunterbooks.com and tell me your t-shirt size and postal address. With the release of In Another Life, I’ve been very busy doing a blog tour. One of my favorite stops was at Jean the Book Nerd, where this was previously published on March 20th. I thought I’d share it with you. Accidentally body slamming a hot guy and making him spill something special. A vague memory can be the key to unlocking the secrets of your past. A good best friend can help get you through just about anything. Your destiny isn’t determined by DNA, but by your choices. When a dad’s superhero status is tarnished, his little girl’s heart is broken. Parents aren’t perfect, but some deserve a second chance. If we let it, our past can prevent us from having the future we deserve. Divorce can be as hard on the children as is it on the couple. When your dog barks at the window, someone who means you harm might be peering in. Being accused of attempted murder isn’t any fun. In Another Life is available now at Amazon, Barnes & Noble, Books-A-Million, Indie Books and Powells. The winner of my In Another Life pre-order contest in Karen Lindsay. Karen, you’ve won an Ancestry DNA kit. Please email me a cc@cchunterbookscom with your address and I’ll send it to you. Congratulations!